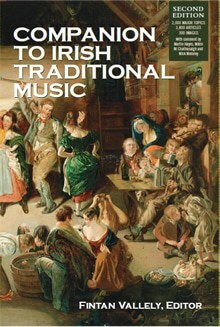 This is a landmark for a reference publication dedicated to Irish music, and opens up a huge new potential for the encyclopedia’s use in education in particular. The online formats make it possible for schools and colleges to economically manage productive access to the book’s huge volume of data: searches for places, names, music or instrument references, quoting information or gathering together linked but diffuse information on such as dance or song – as part of project and music programme research. Each of these digital versions also has the terrific ability to not only find a term or name within the book itself, but will also do a search on the web for the same term. A wonderful way to save time and to broaden knowledge, this ties the data from the book into the huge resources on the internet.This revolutionises the Companion’s potential, making it a highly convenient, valuable, everyday resource for any musician, music lover, music student or researcher. The kindle format is the most versatile, for it can be read not only on light, hand-held Kindle devices, but also on most mobile phones, all tablets and PC and Mac laptops and on all systems and makes of desktop computer. The iBooks version can be read only on Apple iPhone and iPads. The software needed to read ibooks or kindle is available for free download. The digital Companion is hugely superior to browsing websites – the entire book is downloaded to your device and once installed requires no internet or wireless connection – it is always there. That is, unlike the very valuable sites such as thesession.org, or the amazing facility of Tunepal, you can have the Companion wherever you go, no matter how remote – uninterrupted. The ebook version will cost €29.99 – half the full, hard-copy retail price. A kindle reader weighs 170 grams, the hardback Companion weighs 1.7 kilograms: for a regular reader that’s half the price, one tenth the weight. WHICH FORMAT SHOULD YOU GET – Kindle or iBooks? Can be used on laptop AND phone, tablet etc. A stronger reason to purchase the Kindle version is that you can read both on mobile devices (all systems) AND on your laptop or desktop computer. Perhaps more useful for students, travellers or for musicians on the road. It does not have the overall text broken down into separate A-Z chapters however, and though it gives search results in chronological order, it does not identify what chapter they are located in; this may make the interpretation of search results more cumbersome. A stronger reason to purchase iBooks version is if you will be reading only on an iPhone or iPad, for it is easier to negotiate. It has the overall text broken into A-Z chapters, and gives chapter and page numbers to identify where searched-for items are located. This makes searching clearer and ultimately faster, and also makes it easier to go to a particular section for sustained reading; it is also very useful for research, detailed quotation, referencing or planning by such as teachers.